Once more into the vault my friends, once more into the vault. Step back in time, to a time when the modcast was young and fresh. Take a giant step outside your current listening constraints and journey with me all the way back to 2010. I've opened up the vaults and dusted off a classic modcast that I think you'll enjoy. Again. Welcome to the 200th modcast of Mr. Suave's Mod Mod World. 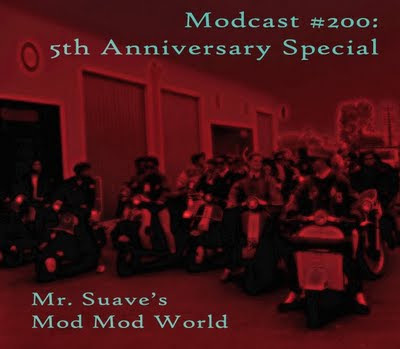 And, this is the 5th anniversary of the modcast. That's right we've all survived 199 modcasts. When this show started Osama really was living in a cave, no one outside of chicago had ever heard of Obama. My how things have changed. 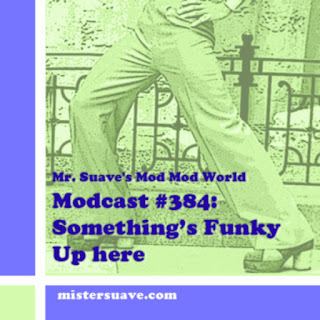 I started this modcast in part because it seemed to me that a lot of great mod bands from the original Southern California scene of the 80s never got their due. My first few shows were dedicated to sharing the music of some great 80s mod bands and then it just sort of grew from there. Here we are a couple hundred shows later, and I still feel like some great bands are just lost in the mix. So, I'm circling right back to where it all started. Joining me this week is my long-time compadre Ken who survived all those early days in the scene along with me a few other concert-tested veterans. We've each picked out some key songs from the likes of The Question, Manual Scan, The Three O'Clock, The Modsters and more. Enjoy, and for my tenth anniversary I promise something more contemporary. See you then.